The More Spiritual You Are, the Less You Need to Think. Read more in Glenn Packiam’s Why Thinking is a Vital Part of Christian Growth. For the past few years, I’ve found myself less interested in the praise and worship songs portion of church and pining for a deeper understanding of scriptures and their greater context. What are the questions I need to ask that I haven’t been asking? What spiritual myths have I been accepting just because I’ve heard them enough times? I recently heard that the Bible doesn’t state a requirement to be baptized before taking Holy Communion. Something I need to study for myself. I had a friend who enjoyed the Presbyterian church because it was cerebral and not overly dependent on emotion. Glenn Packiam says we should let Truth define Experience instead of letting Experience define Truth. What can our churches do to be places that offer that type of truth? 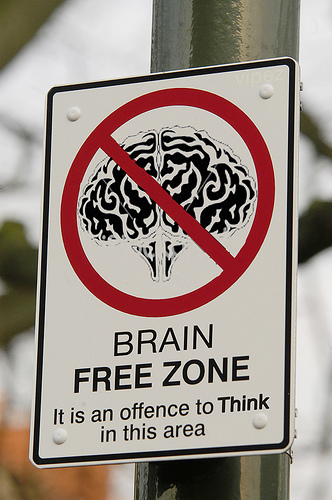 To be a place where it’s OK to think? What can we do to be members that encourage truth-discovering? What happened in your life that led you to find truth? Did it happen in a church or elsewhere? This entry was posted in Churchiness and tagged myths, praise and worship, thinking. Bookmark the permalink.